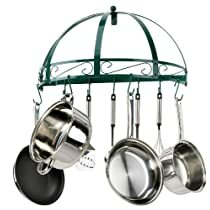 Have FUN Decorating and Organizing With A Wall Mounted Pot Rack! 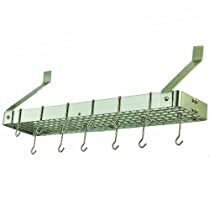 When you have a small space or just want to add some personality to your kitchen you can do so with wall mounted organizing. 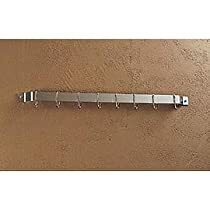 The kitchen is a great place to start your wall mounted organizers with a Wall Mounted Pot Rack! Great Organizing Tips! 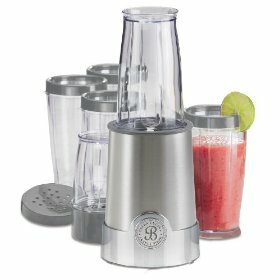 You will organize your pots, create an appealing decorating display, and save time when you are cooking because you can find your favorite pots right away when you need them. 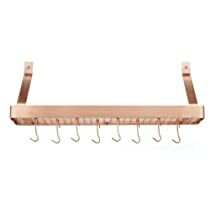 On this page you will find wall mounted pot rack options with shelves (bookshelf styles) double and single bookshelf pot racks give you a place to display other things you will need while you are cooking or a favorite collection. 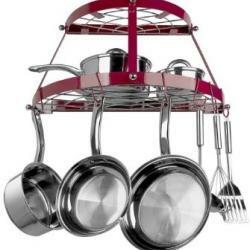 You will find flat, half round, and great kitchen organizing storage tips! 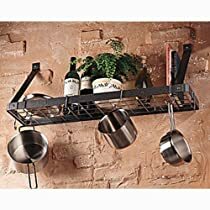 A Bookshelf Wall Mounted Pot Rack gives you a great place to include decorative items, cookbooks, or other utinsels and keepsakes on the same rack as your pots and pans. 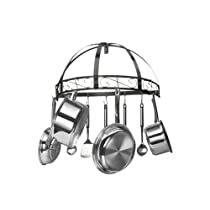 Look at these ideas for decorating and imagine your pots and pans hanging from under the shelf. 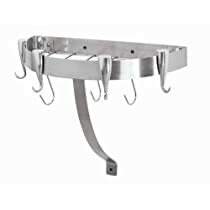 The options are varied and you can have this type of pot rack in a few different designs and finishes to fit into just about any kitchen decor style. This is a space saver! 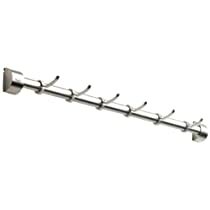 A bar style wall mounted pot rack gives you the freedom to install just about anywhere. 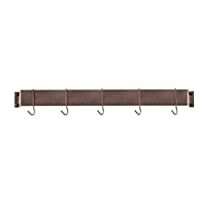 You can install a series of them (vertical or horizontal) to create any kind of design you would like. 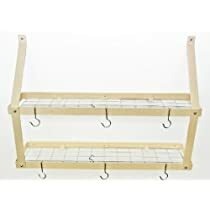 This option is especially great when you have limited wall space and need to tuck in an organizer where other pot racks wouldn't fit. Consider using this for utinsels as well. 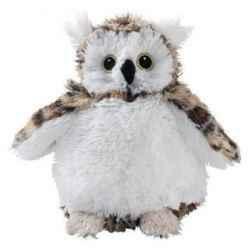 Buy one for pots and pans, one for utinsels, and perhaps a third for magnetic knive set (with magnets in the handles). 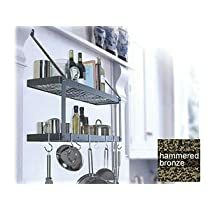 Great idea for small kitchens, RV, or for your wet bar area (use the hooks to hang up bar towels or utinsels you use when serving and mixing beverages or snacks during parties). 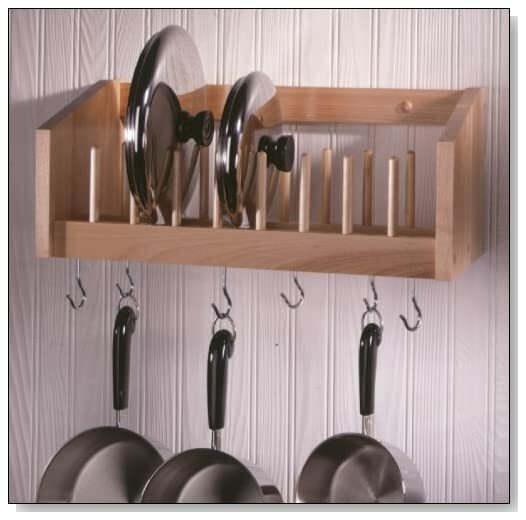 Pot & Lid Rack Wall Mounted Pot Rack with a divided shelf for pot lids. 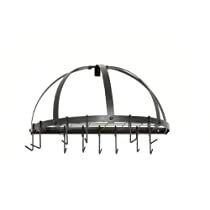 One of the best benefits of a Half Round Wall Mount Pot Rack is extra space. While the wall side is going to allow for a couple of pots you will also have the space in the half round. 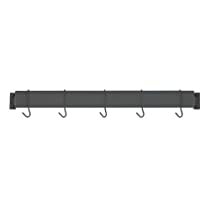 This is over double what you would have with a bar style pot rack taking up the same wall space. 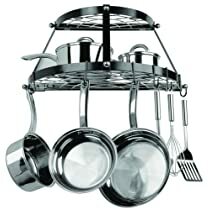 Not only that, these give you opportunities to create interesting displays with your pots and pans. Think of ways to decorate with other elements as well. 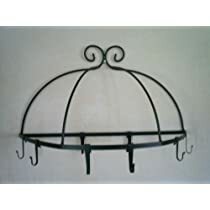 For example, you could use the a style with a dome (the old dutch or wrought iron styles below) and put vines around the top sections. If your kitchen is a garden theme you might consider using rose vines (the silk kind). Remember artificial plants will need periodic cleaning so mount them so they can be removed once or twice a year depending on the amount of cooking you do. 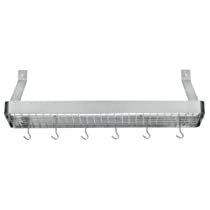 The use of an exhaust fan while cooking will minimize the need for cleaning higher surfaces as well. 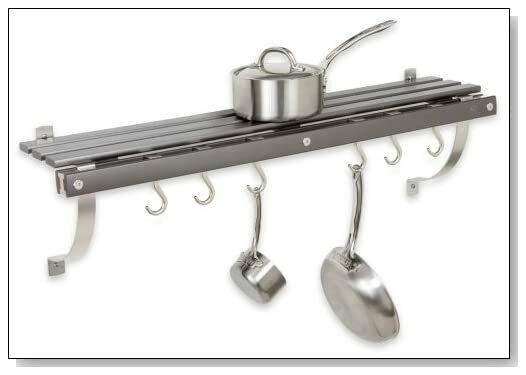 The double bookshelf wall mounted pot rack gives you even more room to display items while also organizing your pots and pans. 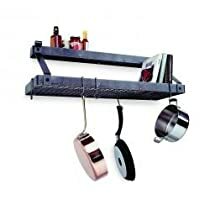 You can use the shelves for books, canisters, or other items you use while you are cooking. 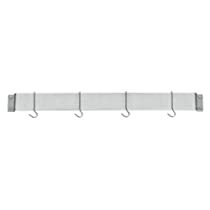 OR you can use the shelves to display momentos or decorative sculptures. 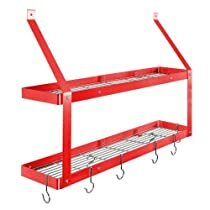 IMPORTANT:Be sure to install the rack so it will hold all the weight of your pots, pans, collections, etc. 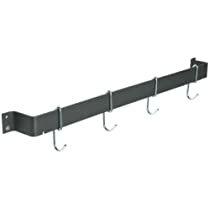 Follow the instructions as well as making sure you have all mounts on beams in your wall. 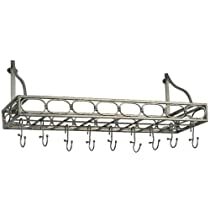 Another great two shelf pot rack is in the half round version. 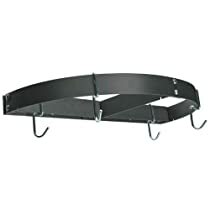 Mount it on the wall and use both shelves as well as the hooks for your pots, pans, and utinsels. This is the deluxe way to organize the things you use the most so they are handy and ready when you are cooking. 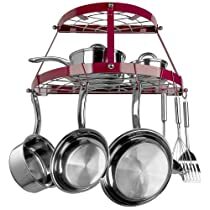 The beautiful design will fit into any decor and you can choose from different finishes to make it even more coordinating with your decor and you pots and pans collection.